Take some time out so you can focus on recharging your batteries, relaxing and having fun with like-minded individuals for a few days. Spend your days doing what you enjoy most. 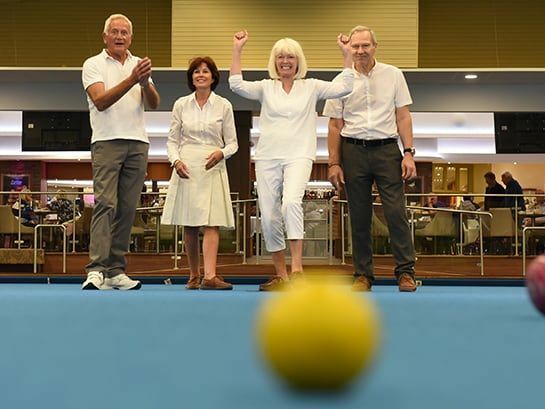 Whether you'd prefer to take part in activities including tennis, badminton, quizzes and more, or would like to simply take it easy by making use of the leisure activities at Palms Health and Fitness Club, including taking a dip in the pool and relaxing in the sauna, what you do is entirely up to you. High-quality entertainment from Potters Theatre Company will headline each evening of your break, as well as quizzes, bingo and social dancing. Then, at the end of a satisfying day, there’s a comfy bed to rest your head. With delicious food, an extensive range of sports and leisure activities, evening entertainment and comfortable accommodation all included in your fantastic inclusive break price, you needn’t worry about spending much money once you’re here. Just bring enough to cover your drinks and any gifts or treats you’d like to purchase on Resort.